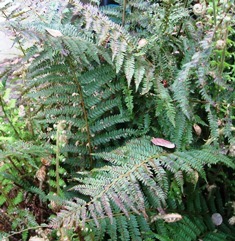 It was interesting to read that one of the dyes used most frequently by Ethel Mairet was bracken (Pteridium aquilinum). 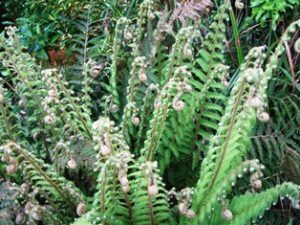 In my garden I have several bracken or common fern plants which need to be cut back, so I decided to experiment with them. I started with the old pruned leaves (see photo below) and was pleased with the results, especially from the alkali (washing soda) modifier. Below are the results which rather surprised me, as I had been expecting the colours from the fiddle heads to be more yellow in tone. 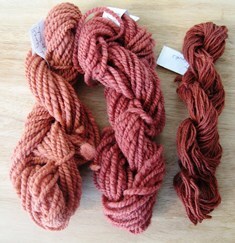 I then decided to try a cool dye bath with the old leaves. 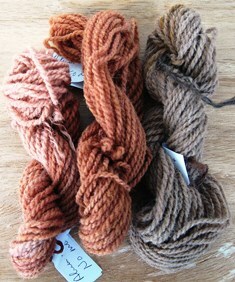 I left the samples to steep in the dye liquid for about 12 hours and this cold soak produced the colours shown below. 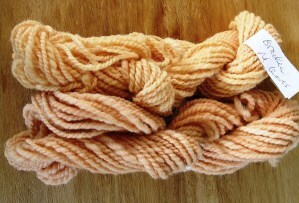 I then re-simmered the old leaves, strained off the dye liquid and added more skeins, this time unmordanted. The results are below. 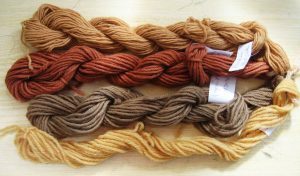 From the left: no modifier, washing soda modifier, no modifier but skein simmered in the dye bath for a longer period of time. Although the skeins are browner in tone than the photo suggests, these results were quite surprising, as I hadn’t expected to get deeper colours from the re-simmered leaves. These experiments gave some interesting shades and I am not surprised that bracken was a dyestuff frequently used by Ethel Mairet. This entry was posted on Thursday, May 4th, 2017 at 12:07 pm and is filed under Dyeing Tips & Recipes, General Dye Information. You can follow any responses to this entry through the RSS 2.0 feed. Both comments and pings are currently closed.